Have you ever gone to have your hair done for a special event? You sit in front of that mirror and entrust your crowning glory to the hands of a professional, trusting that when they are finished you’ll be picture-perfect? Then they have you tip your head over while they tease your lovely locks into a mountain of strands that resembles a rat’s nest more than the cover of Glamour. They spray, back come, and spray some more and you sit watching wondering how on earth they’ll tame this into an acceptable do in time for your event. Except you don’t just want acceptable. If that was all you’d needed, you’d have spent the morning in your own bathroom with your own curling iron. You want amazing. It’s why you sat in her chair to begin with. Only, as you puff away a curl tickling your nose, you cannot possibly see the end product from this messy beginning. He holds time in his hand. He knows how long it takes to get you ready and the exact moment you need to be made ready. 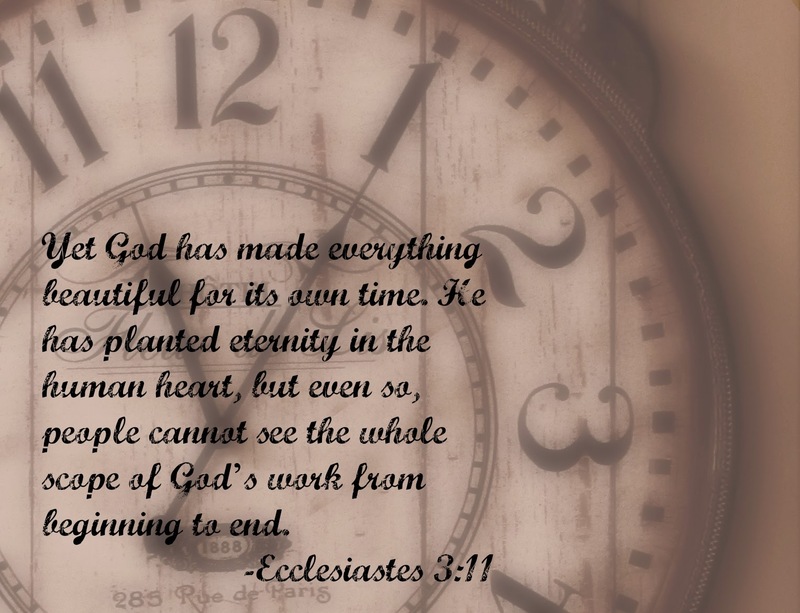 Because not only did he create you, but he created the perfect plan for your life and the seconds that tick by ushering you toward it. His hands move in ways we don’t always understand, but he’s creating something beautiful to be ready at just the right moment. We can’t always see it, but that’s because we don’t understand the scope of his work. It’s not in our order or how we’d do it ourselves. It’s not always the beginning we’d chose and we’re not quite assured it’ll be the ending we want. Just like the gasp you have when the hairstylist places that final bobby pin and you see the final product—something you’d never have been able to accomplish on your own—we must trust God to take every strand of our lives, every messy moment and sticky situation, and create it for the perfect ending to our story. Father, help us to trust that even when it doesn’t look like it, you are preparing us. Let us begin to see even in the stickiness of life, you are working toward our end. Grow in us the realization that we are beautiful in you, even when we cannot see it, and place in us an understanding of your work in our lives. Amen. What a beautiful thought. Thanks!